"You cannot serve both God and mammon,” advises Jesus in the Gospel of St. Matthew, but many of us spend our lives trying to do just that. Our inner search is real—and so is our desire for the pleasures of this world and the money that can buy them. In this Spring 2018 issue on “Wealth,” we explore how men and women, great teachers and ordinary sinners alike, have approached this fundamental challenge of human existence: God, mammon, or both? The ways are many. Most radical are those, including monastics, who choose voluntary poverty, a path considered here by Zen teacher L.F. Habito; and their opposites, the impossibly wealthy, the 1% of the 1%, who may desire to make good moral use of their fortunes, in this issue represented by Andrew Carnegie, father of modern philanthropy. 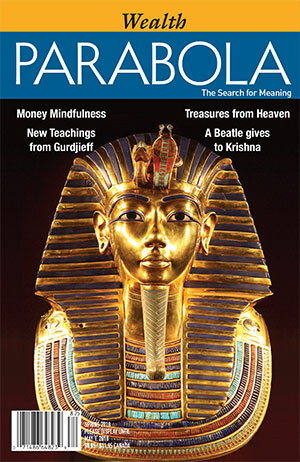 In between arise a choir of voices, from Beatle George Harrison debating whether to fund his guru’s book, to bestselling Buddhist monk Matthieu Ricard, who tells of a Tibetan saint and his brush with a robber, to a Native American woman who reminds us that wealth includes community, knowledge, and tradition. We are particularly pleased to present in these pages an excerpt from the new book Paris Meetings 1943, transcripts of the meetings that G.I. Gurdjieff held with his students that year in Nazi-occupied Paris. The notes of the meeting of December 23rd that appear in this issue touch directly upon questions of money and payment. It’s clear from this record and others that Gurdjieff, who pursued money, used it as a form of energy to further inner work, both his own and others’. In itself money may be neutral, like fire; but with an equal ability—again like fire—to serve humanity or to consume it, wealth demands to be approached with wisdom. May this issue help all of us to do that. Cover Description: Replica of the funerary mask of Tutankhamun in the Egyptian Museum, Cairo. Tutankhamun was a pharaoh of the 18th Dynasty who ruled from 1332-1323 B.C. His tomb was discovered by Englishman Howard Carter in 1922.